By 1979 George Harrison had already established himself as a music legend with The Beatles and Monty Python had transformed the British comedy scene. Even before the conception of Handmade Films Python had created Monty Python and the Holy Grail, and had moved on to the Life of Brian. Indeed Life of Brian’s origins date back to 1975, with the first concerted writing session in December 1976. Had it not been for the decision of EMI’s 69 year old Chief Executive, Lord Delfont, in early 1978 to cease supporting the project, due to his concerns over the morality of the subject matter, history may never have seen Handmade Films unfold. 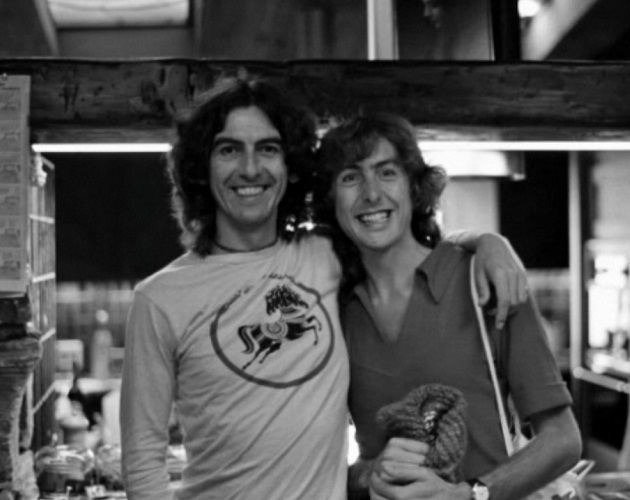 Eric Idle’s friendship with George Harrison, and the latter’s interest in the film and generosity to support it ensured that filming of Life of Brian got underway on 16th September 1978 and over 41 days progressed remarkably smoothly. Life of Brian received its world premier in New York on 17th August 1979 and the rest, as they say, is history. Handmade Films was born out of this project and through the combined efforts of George Harrison and his business manager Denis O’Brien, the trust between the two being considerable. Whilst the relationship between George and Denis was to end in a negative manner, between 1978 and the early 1990’s, the creative talent attracted by the company was to produce some of the most memorable films in British media history, these of course include Mona Lisa, Nuns on the Run, The Long Good Friday, The Missionary, Time Bandits and Withnail and I. Even those talented individuals involved in some of the internal dramas at the company through this period retain a fondness for the incredible experiences and special bonds created. In 1999 the original Handmade ceased to exist and Monty Python took ownership of Life of Brian, and Live at the Hollywood Bowl. The remaining 22 titles were retained by Handmade, under new ownership, and between 1999 and 2006 two further libraries were acquired increasing the number of films owned to 92. During this period the company expanded through organic growth and acquisitions and dallied with a disastrous stock market listing in London, which brought the company finally to its knees once more in early 2010. In the five years since, new management have cleaned up Handmade, refocused the company as an intellectual property rights owner and is far more selective about the activities it undertakes. The current Board is also very conscious of the historical integrity of the company and is actively pursuing appropriate projects in conjunction with suitable partners and some of the creative talent from the very start of the company. Arguably Handmade helped project the careers of Bob Hoskins, Helen Mirren, Richard E Grant, Paul McGann and establish the existing credentials of many actors, actresses, directors, producers and authors. Our aim, decades after the speculative start of this adventure, is that under new management we can replicate the very best of the history thus far.